Building hats. | An alien voice under a duvet of dreams. 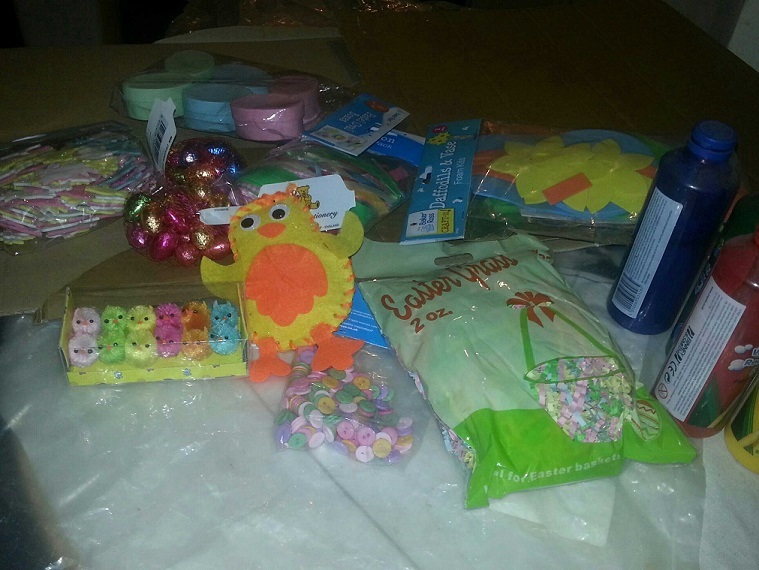 Posted by phoenixaeon in Creativity, Easter, Easter bonnet, The Principessa Files. 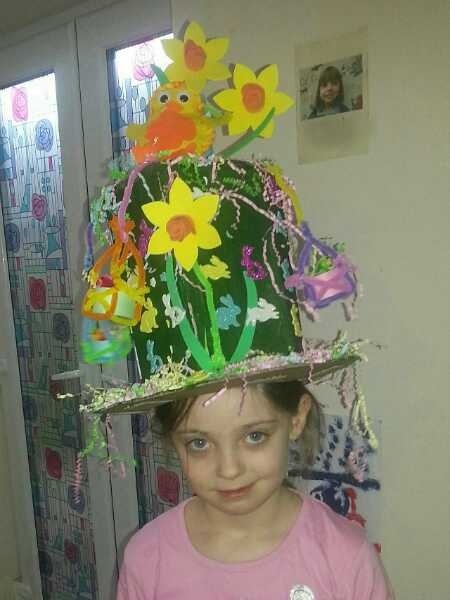 After the misery of constructing last year’s Easter bonnet, what with me being ill and only having two days to make it, I decided to get a head start on it this year. Auntie K and I sat down and started brainstorming how we were going to sort out the first step. 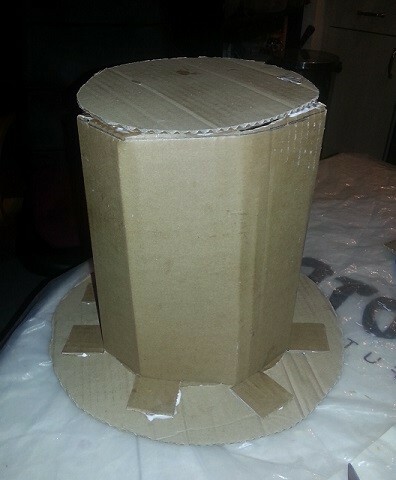 We had a long piece of cardboard that we were planning on making a top hat with. Guesstimating the size of Princi’s head, we drew around some plates to make the top hat brim, then used the rest when we had decided on how tall we wanted it to be. Then the wrestling match with the remnants of the box ensued as we fought to manipulate the cardboard into some semblance of a cylinder. Eat your heart out, Mad Hatter! As you can see, it didn’t end up perfect. But hey ho! On we went, painting and a-sticking, and generally just hamming – or should that be chicking? – it up. 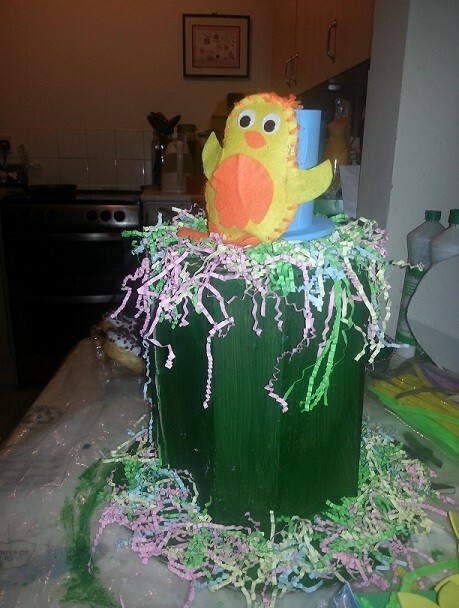 Thankfully, Princi had made the chick a few weeks ago. The evil chick-tator on high! But we weren’t finished yet. Oh no! With Princi home from school, we set about sticking glittery rabbits all over the hat, making hanging Easter baskets with little boxes and pipe cleaners, and creating foam daffodils…. It’s a good job the bloody thing was correctly guesstimated and was a perfect fit for Princi’s head. 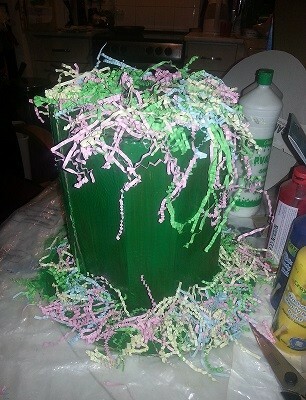 The completed top hat (Easter bonnet). Whoa! THat’s an intense hat. I don’t think Easter bonnets are a ‘thing’ in our family yet – they haven’t come up in their school, anyway. They have been a ‘thing’ for the last two years here after I missed the first Easter bonnet parade that Princi was allowed to take part in. She cried for the whole weekend after. But she was chuffed last year because her bonnet won because it was home-made and not a straw hat decorated with fake flowers. She’s fully expecting to win again this year, despite me telling her not to be disappointed if she doesn’t.